Winning isn't everything--but wanting to win is. The quality of a man's life is in direct proportion to his commitment to excellence, regardless of his chosen field of endeavor. It's not whether you got knocked down; it's whether you get back up. The real glory is being knocked to your knees and then coming back. That's real glory. Thats the essence of it. football is like life - it requires perserverance, self-denial, hard work, sacrifice, dedication and respect for authority. 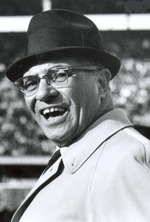 Andy Palau left for Fordham in 1942 and Lombardi became the head coach at St. He began coaching as an assistant and later as a head coach at St. You will never lose another championship. Vincent Thomas "Vince" Lombardi (June 11 1913 – September 3 1970) was an American football player coach and executive. 8% (96-34-6) a preseason winning percentage of 78.